Warning: This post contains small rants! You have been warned. PBBI have recently released MapInfo 11, the new version has brought one change that I think deserves some attention – even if for the wrong reasons. First off it’s slow to resize, this would be due to them using .NET WPF for the new browser (I have never seen a good fast .NET WPF datagrid). Then we have sorting, which is meant to be the cool new feature. This is not the normal just click on the header to sort the column, no because that would be too easy, you have to right click in the browser, click sort and select the options which then opens a new browser window. um what? Yes this is a pretty handy feature but no it shouldn’t be the only way to sort, you should have a click on the header kind of sort. This seems to be what people wanted. Next. No visible scroll progress. When you move the little scroll box on the side the browser waits until you have finished to show you the data. I guess the old browser did this too so why change it! And finally shift click to select a block of rows doesn’t work, I mean come on this is not a hard thing to do. Surly you can dock it? Nope! In the end we have a browser that is pretty much the same as the old one but slower……oh and has alternating row colors. Now if you are reading this blog you are well aware that I am a huge fan of QGIS, I don’t really make that a secret. So I guess the overall point of this post is to compare the QGIS attribute table (browser) and the new MapInfo 11 one. Lets run though the same list as MapInfo. Slow to resize? Nope. Even with a large table open the resize speed doesn’t change. Header based sorting? Yep. Just click the header and it will sort that column. Multi column sorting is on the to-do list. Live scrolling (results update as you scroll)? Yep + no lag. Shift click to select blocks of rows? Sure why not. Or you can hold ctrl to select rows all over the grid. Docking? Yep and floating so you can put it on a different monitor if you need. 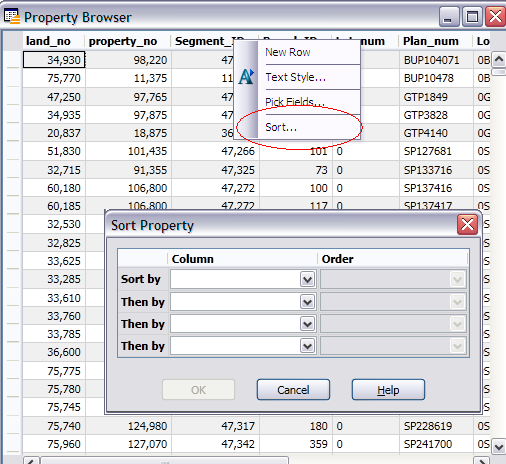 The QGIS attribute table has a built-in search/filter box, saves having to run a query and have a new window like in MapInfo if you just want to filter the browser. 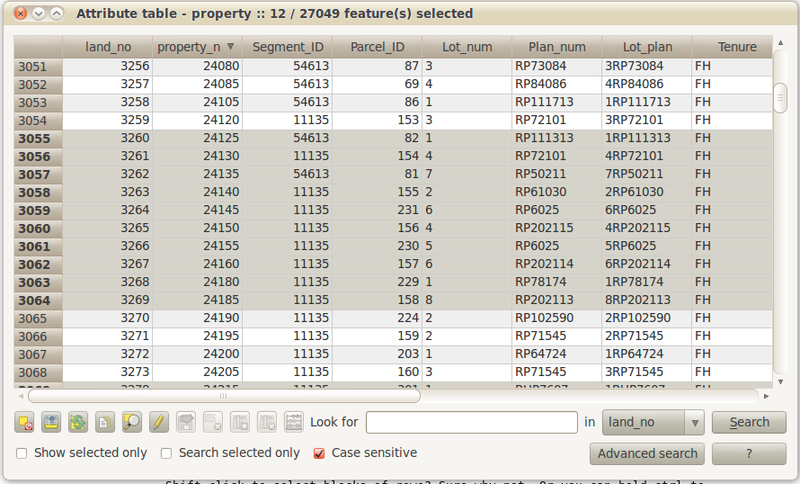 The QGIS browser can even have other UI objects inside the cells. Very bloody handy. Combo box in browser table. You can even have a calendar date picker if you want. Why does it need to open a new browser window? At least make it an option. Yes you can use http://www.pbinsight.com/support/product-downloads/item/windowhelper for this support. It’s a good tool made by a guy at MapInfo go and download it. I just think it should be built in. Doesn’t look too good for MapInfo at the moment. QGIS is even accessing the TAB data though ogr. Quick tip: if a free program can access and manage your data faster than you, you are failing. Both programs opened a 27000 row .TAB file. Just for the record I’m not anti-MapInfo. It still has some features that I really like. I just wish they would pick up the game. The things I would like to see in QGIS. What are yours? Here is my little wishlist of a few things I would love to see in QGIS. I was thinking more like ArcGIS data frames vs something like what MapInfo has (multiple windows). I think the multi window system can add confusion for people new to GIS, plus I hate having to window manage. This is something that I really like from MapInfo. It adds a lot of power to the application being able to spatially join two tables that don’t share a command link column and get back a new layer. Adding this to QGIS could be a pretty big task, although a very rewarding one IMO. Now there is some credit in saying “well you can just import your data into PostGIS and use that”, however that is not always a option and I think having a layer above that can query any open layer would be very very powerful. These are just two of the main things that I would like to see, I’ll update the post if I can think of anymore. Of course being open source I can write the features myself but C++ is still a bit over my head at the moment. I would love to see what other peoples thoughts, or mini wishlists, are. So if you are willing, drop a comment and let me know.